A tragic plane crash in South Bend, Indiana on Monday, November 13, claimed the lives of four Two Rivers Marketing Group employees and the plane’s pilot. Pilot John Trewet, an attorney, was flying four members of Two Rivers Marketing Group back to Des Moines, IA from South Bend, IN Regional Airport after a business meeting when the plane went down in a cornfield shortly after takeoff. The Two Rivers employees killed were former NAMA member Tom Dunphy, as well as Eric Jacobs, Leslie O’Bannon, and Josh Trainor. Our deepest sympathies go out to all of the families, friends and co-workers of those lost in the crash. 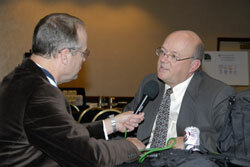 Nearly 200 attendees participated in the 2006 Agribusiness Forum that was held November 14-15 in Kansas City. This year’s Forum took place just prior to the NAFB Convention and featured industry experts from inside and outside the agricultural community. Individual speakers and panels explored topics such as the global forces shaping agriculture, biofuels, and branding. Ann Ness, Vice President of Corporate Brand Management at Cargill, presented Repositioning the Masterbrand: The Cargill Case Study at the Forum. Cargill is a family owned company that began as a grain elevator and has grown to 152,000 employees in 69 countries and more than 80 businesses. In 1999, Cargill made a change in their business model and launched a new identity in 4 steps over 6 years. The first step was the creation of a brand council to develop a corporate vision statement, a purpose and vision, how to approach it and to measure the performance. Next was the brand architecture. Cargill wanted to operate as a master brand and not as a holding company. Their goal is to be the global leader by 2010. Cargill then developed brand positioning with the help of a brand strategy firm. This firm made Cargill talk to their customers who said they do not think of Cargill as an innovator or as collaborative, but strictly as a commodities provider; but said they viewed Cargill as very smart. This research led to the creation of brand positioning. The final step was advertising strategy that focused on providing evidence of relationships through television commercials. So, is this working to reposition the Cargill brand? Cargill measures attitude and awareness every year and what they are finding is that perceptions are broadening and improving. “We are very encouraged by results,” said Ness. Cargill has been able to measure farmer responses with focus groups around the world. Cargill also had to change internally. They had to refocus, “changes had to be made internally in order to deliver externally. Part of Cargill’s success is their entrepreneurial spirit,” said Ness. For more information on the Forum sessions and interviews with the speakers, visit the Forum blog written by Chuck Zimmerman, AgWired.com, in the NAMA News. NAMA is a great way for college students to begin their careers in agribusiness. Student NAMA members have unlimited resources at their fingertips to help market themselves in the industry. Since 1969, when the first NAMA student chapter formed at Cal Poly-San Luis Obispo, NAMA has grown to 38 chapters and over 1,200 student members. The most accredited chapters NAMA has ever had! We attribute this tremendous popularity to the variety of programs initiated to benefit the students. We welcome the new chapters as well as the returning chapters to Student NAMA! “The goal of negotiating is to build and sustain relationships,” Darryl Salerno, President and founder of Second Quadrant Solutions, told North Central NAMA members attending the October 19 negotiating workshop held on the University of Minnesota-St. Paul campus. Second Quadrant Solutions, a New York-based consultant group, provides executive coaching and professional development training for service organizations. Based on the premise that all aspects of human interaction are essentially negotiations, Salerno’s workshop took participants through information and several exercises aimed at achieving the best possible results while maintaining a positive relationship with the other party. Attendees learned about working with the three critical elements of negotiating: time, power and information. The session culminated in a spirited one-on-one practice negotiation that demonstrated the typical tendency to negotiate for a “win” for oneself. Following the conclusion of the afternoon session, members enjoyed networking time. Special thanks to Greg Smith, Padilla, Speer Beardsley for speaker arrangements, and Dr. Ward Nefstead, University of Minnesota NAMA Student Chapter advisor, for organizing the campus classroom location. 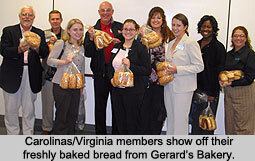 Several members of the Carolinas/Virginia NAMA Chapter gathered together on October 17 in Mount Airy, North Carolina for a tour of Gerard’s Bakery. Gerard’s Bakery is owned by Mountain View Harvest Cooperative, a value-added cooperative formed as an alternative investment choice for its members that provides higher returns than production agriculture. 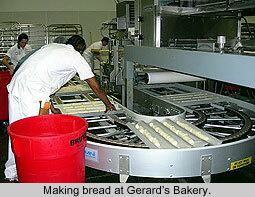 A portion of the flour used by Gerard’s is made from identity-preserved wheat supplied by its members. Headquartered in Longmont, Colorado, Gerard’s sells unique breads and rolls to restaurant chains and food service sections of grocery and convenience store chains. Plant manager, Joe McGowan, conducted the tour. Following the tour, Robin Rhyne, president of the Surry County Economic Development Partnership, told members about how Gerard’s Bakery markets their products and about its impact on the local economy. Joanna Radford, a local farmer and shareholder in Mountain View Harvest Cooperative, also spoke about the agricultural production side of the business. 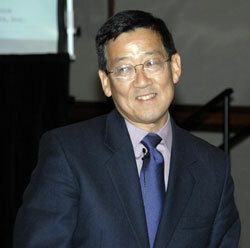 The last presentation at the Agribusiness Forum yesterday was given by Sano Shimoda, BioScience Securities. Although the title of the session started out with “The Final Frontier . . . ,” Sano thinks we’re just beginning. He’s very optimistic about the future of American agribusiness. In reference to biofuels, which were a topic of discussion here, he says that we’re going to have to become cost competitive in order to fully develop our capabilities. 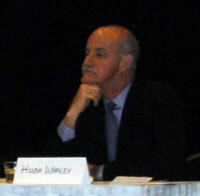 One of the presenters this afternoon was Hugh Whaley, Osborn & Barr Communications. 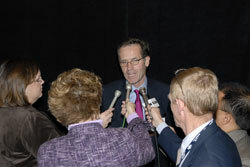 Hugh was representing the soybean industry and the United Soybean Board in particular. He says that there was a lot of interest from the group in the kinds of soybean varieties that are in development that will help provide more oil for both food and fuel use. He also says that feeding soybeans to animals is still the biggest use of the commodity but that may be challenged in the future as the biofuels business grows. One of the presenters this afternoon was Lyle Orwig, Charleston/Orwig. He’s being interviewed afterward during the break by Roger Ward. 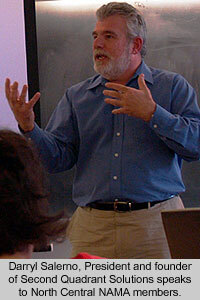 Lyle was talking about the biofuels impact on food companies and their suppliers. He says that as more commodities are turned into fuel it’s going to have an impact on the supply available for food purposes. 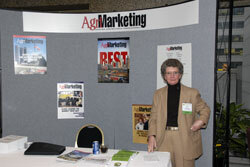 Out in front of the Forum sessions this afternoon you’ll find Agrimarketing Magazine on display. Here’s Judy Knoll, Advertising Sales Manager/Customer Services taking charge of things. Judy says to give her a call because she likes it when her phone rings. I’ll let her explain that to you. The end of this year’s Forum overlaps with the NAFB. Here’s Dan Basse, AgResource Co., after his panel discussion. This is a sight you don’t normally see at a NAMA convention. It looks to me like there’s good attendance from both organizations.